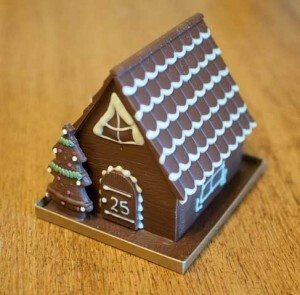 Just before Christmas we won a Betty’s Milk chocolate house through a competition on the internet. Our daughter is a self confessed chocoholic so she couldn’t wait for us to receive it, We received the box with the house in very soon after we won. The packaging which we received the house in was really good it was packaged in a box within another box with lot’s of packaging material around it. They certainly wanted to make sure that the items are received in perfect condition. 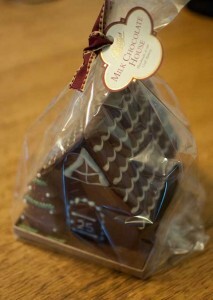 When we opened the box to reveal the house, It was so lovely. It really looked too nice to eat. The house has the number 25 hand piped on the front door for Christmas, and a cute decorated tree by the door. We have had it on the sideboard so people could admire it throughout Christmas but as it’s time to take the decorations down today we decided to let our Daughter try it. She has pestered about wanting to eat it all through christmas. She couldn’t wait to get stuck into the tree and promptly pulled it away from the house and chomped it. The chocolate is very good quality and nice and creamy. 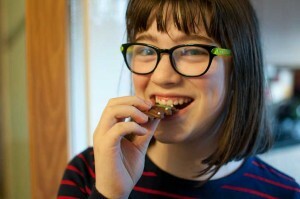 I couldn’t eat too much myself as it’s quite rich for me as a non chocoholic, but my daughter would have quite easily eaten the whole lot, and probably been a little ill though afterwards as you do get quite a bit of chocolate for your money. The house was available to purchase from bettys.co.uk for £12.95 , It’s now showing as unavailable presumably because it’s not Christmas anymore. I guess they may sell an alternative house now without the extra added Tree and Piping. If the other items they sell are as nice as this I wouldn’t have any problems recommending Betty’s to anyone who wants to send a treat to someone, or to treat themselves. Looking at their website they sell all sorts of goodies like cakes, biscuits and celebration hampers.